The GROHE Red 8 litre boiler helps you make tea, blanch vegetables and sterilize cooking utensils or baby bottles – instantly and effortlessly. This convenient boiler for kitchens without a hot water supply was made to fit under all regular kitchen basins, replacing a flow-type heater. The GROHE Red 8 litre boiler provides up to 6 litres of boiling water (100°C) or 15 litres of hot water (50°C) directly from the tap, freeing up space on your kitchen counter as you'll no longer need an electric or stovetop kettle. And there'll be no more waiting for water to boil, saving your precious time. The GROHE Red Mono tap supplies boiling water only. Installed separately next to your regular kitchen tap, it will help you save precious time on your kitchen chores. Combining it with the GROHE Blue system, you will have water delivered at any temperature from boiling hot to cool and chilled, to suit all your needs. 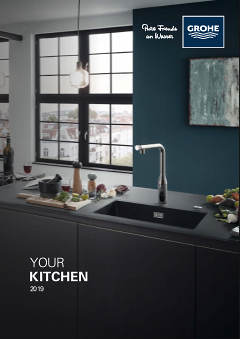 Upgrade your kitchen and enjoy maximum convenience with this modern tap system. Childproofing is a top priority for us at GROHE. With our GROHE ChildLock system, a two-step pull-and-turn movement of the left handle is required to activate the boiling water flow. The tap has been independently tested and certified to meet childproof safety standards. GROHE CoolTouch provides a reliable insulation of the interior water channel, so the tap body is safe to touch even when running water at 100°C. The tap can be safely used in households with children thanks to this technology protecting their sensitive skin from scalding on hot surfaces. All boilers of the GROHE Red range are made of titanium. This premium material is highly resistant to corrosion and limescale build-up and known for its biocompatibility. It imparts no metallic taste to the water, so the water coming out of your GROHE Red tap will always retain its original pure taste. Perfect functionality for everyday use: this spout turns smoothly within a 180° radius, giving you full operating control without it hitting any surrounding cupboards or walls.